Who knew? Apparently, cats and coffee make for a “purrfect” combination. The Cat Café, a two-room pop-up shop in New York City where customers can sip a fresh-brewed cup-of-Joe and pet a cuddly cat, officially opens for business today. The café is sponsored by Purina ONE pet foods, and will feature at least 16 adoptable cats from the North Shore Animal League, the country’s largest no-kill pet shelter. All of the cats who will be featured at the café have been evaluated closely to ensure that they are people-friendly. Customers can grab a coffee or pastry in the café’s 600-square-foot front room, where baristas are busy brewing fresh drip coffees from a local Brooklyn roaster. The second room is a 1600-square-foot space that includes a number of couches, tables, chairs, and plenty of fun climbing and perching structures for the café’s kitties to enjoy. Passersby can gaze in through the café’s floor-to-ceiling windows and watch the cats lounge and play. The Cat Café has an action-packed agenda for the short time it will be open to the public, including a number of lectures and demonstrations on cat health, feline communication, and “cat-friendly interior design,” Eater NY reports. And apparently, “Dancing with the Stars” judge and fellow cat lover Carrie Ann Inaba will stop by Thursday to talk about her two cats. NYC tourist Tahnee Nicholson thinks the café is a great idea. Cat cafés aren’t exactly a new idea in other parts of the world. When the very first cat café opened in Taipei, Taiwan in 1998, it caused a sensation with tourists, who flocked from all over Asia to cuddle with kitties and sip “cat’achinos.” The concept gained a lot of popularity in Japan, including Osaka, where many apartment owners are not allowed to keep any furry friends. Cat cafés are also a sensation in many European cities, including Vienna, London, Budapest, Turin, and Paris. Inspired by the success of international cat-themed cafés and encouraged by the buzz surrounding the NYC pop-up location, excited business owners and cat aficionados here in the United States are hoping to open up cat cafés of their own. An Indiegogo fundraising campaign was launched April 10, the organizers hoping to raise $50,000 to open a cat café in San Diego. And E! 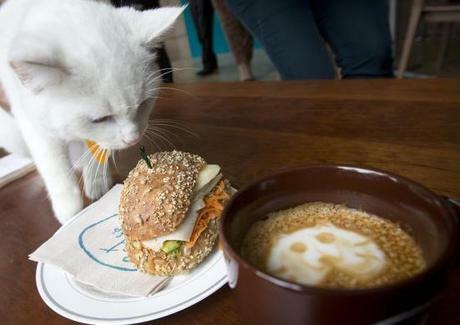 Online says that cat cafés could open in Los Angeles, San Francisco, and Oakland, California by the end of 2014. Hopeful L.A. cat café owner Carlos Wong has already been approved by the L.A. Department of Public Health and the Department of Animal Services. Wong is currently trying to raise $350,000 to open his dream business, Catfé. His first attempt at fundraising on Kickstarter fell short, but Wong is still optimistic. “Pet cafés offer a nice alternative. People come in to unwind, get a warm drink and snack, and spend some quality time with their furry friends,” Wong says in his Kickstarter video. If you’re in NYC and want to check out America’s very first cat café, stop by 168 Bowery on the Lower East Side for a hot latte and some feline fun. But you’d better hurry — The Cat Café is set to close up shop this Sunday, April 27. Plans for a permanent location aren’t underway — at least not yet. For those who aren’t in NYC this weekend, Purina ONE will be livestreaming the goings-on at The Cat Café everyday from now until Sunday.